Hanover Engineering provides annual dam inspection services to Bear Creek Lakes Civic Association located in Penn Forest Township, Carbon County, PA. Bear Creek Lakes is a residential community consisting of permanent residences and vacation homes surrounding a 160 acre man-made lake, which provides both recreational and aesthetic value to the community. Due to the lake’s size and its proximity to the residential structures located down- stream, the lake’s dam is classified by the Department of Environmental Protection as a high hazard dam, and therefore must be inspected annually by an experienced professional engineer. The dam inspection consists of a site visit to complete a detailed review of the working components of the valves and outlet structures, as well as a review of the overall condition of the dam to ensure no structural deficiencies have developed that may lead to a failure. 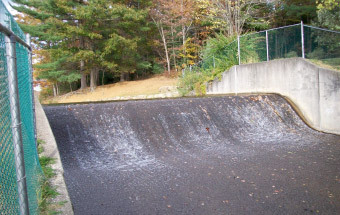 The Bear Creek Lakes dam is located in an area which contains several emergent springs just downstream of the dam’s embankment. The flow from these springs is monitored regularly using a series of weirs, since any abnormal increase in weir flow suggests the presence of seepage through the dam which could be a potential hazard. Inspecting for signs of seepage along the dam and conduits is one of the important items completed during the annual dam inspection.